Stephen Brings Us Another Unexpected Edition! When it comes to the articles about books, I am not your guy. Don't get me wrong, I read, I enjoy reading, it gives me a great pleasure to take those journey's into the imaginations of creative people. However, I am not the man to give you many apt opinions and thoughts about the books I read, other than exuberant cheers about the books I particularly love. While I make a direct point to keep up with the new things from authors like Jim Butcher and Dean Koontz, I missed out on the classics like those you find from Tolkein. I am getting back to reading the Lord of the Rings books, I am not your ticket to real lifetime experience with these stories at hand. However, I did grow up with a direct fascination and interest with what Stephen King brought to the world. His books have always captured my interest, and fears in a lot of cases, and has earned my loyalty with his sheer prowess. One of my favorites was a collaboration he did with Peter Straub called "The Talisman", a story about a boy traversing all kinds of fantastic events over the course of a long journey to save his mother. Traveling back and forth between our realm, and that of what seems like another dimension, he refers to as "The Territories", Jack, the boy, must cross the country to retrieve an item that can cure the cancer his mother has. Fighting along the way against fear, evil, and various other hardships that an eleven year old boy traveling between two worlds, across a continent, can deal with. Stephen and Peter did something very interesting with this book, and many years later, they wrote another book. This time called "Black House", which picked up those many years later, telling the story of Jack as an adult and the mysterious happenings in the town he now lived in. He was out to catch a killer, which of course, was straight out of the land he long forgot. I was thrilled when "Black House" came out, a continuation of a novel I very much enjoyed, and it was definitely a winner. It was very different than the original story, but was well put together in its execution. I bring that up, to bring this up, and many people may not even know about this yet. Today, Stephen King released another book to us wanting fans. This book is called "Dr Sleep". Seems mysterious all on its own, until you find out that this book is the sequel to one of Stephen's most famous books ever. 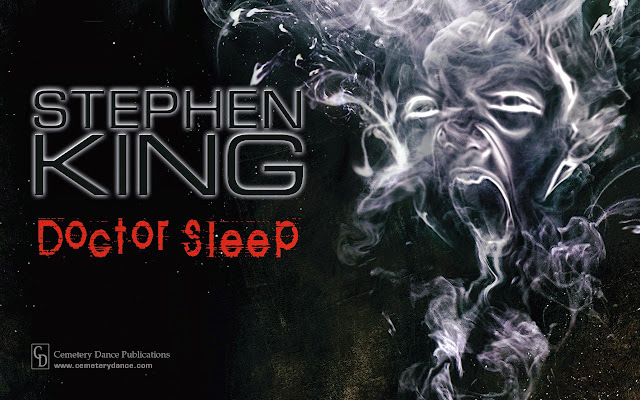 "Dr Sleep" is the sequel to "The Shining". That's right, the absolutely fantastic story of Danny Torrance and his family, set in the haunted hotel, where (pardon the pun) all hell breaks loose. This new book is set roughly 20 years later, and follows Dan Torrance in his life that many years later. "On highways across America, a tribe of people called the True Knot travel in search of sustenance. They look harmless—mostly old, lots of polyester, and married to their RVs. But as Dan Torrance knows, and spunky twelve-year-old Abra Stone learns, the True Knot are quasi-immortal, living off the steam that children with the shining produce when they are slowly tortured to death. Then Dan meets the evanescent Abra Stone, and it is her spectacular gift, the brightest shining ever seen, that reignites Dan’s own demons and summons him to a battle for Abra’s soul and survival. This is an epic war between good and evil, a gory, glorious story that will thrill the millions of devoted readers of The Shining and satisfy anyone new to this icon in the King canon." So, needless to say, I am thrilled, so thrilled in fact that I could not wait to tell everyone about it. So much so that I could not wait for one of my "Books" writers to take up the helm and give us their insight into this new book. I may come back and briefly give my thoughts on the book, but not going to step on the toes of my writer that is going to cover it. She has just started reading it as well, and we should all be anticipating her article about it. Who's as thrilled as I am right now?